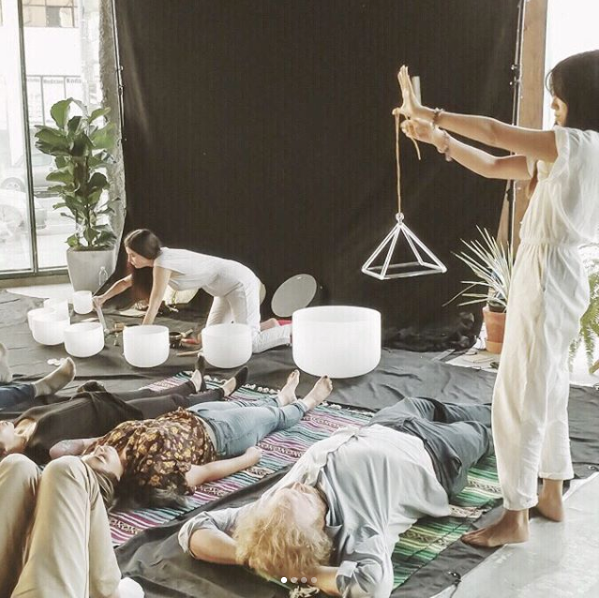 Move over transcendental meditation and yoga, sound baths are today's hottest holistic ticket in town. It might sound like a fad or trend - and, well, frankly it is trending high right now with 33 million Google search results showing up and nearly every yoga, fitness, or meditation studio adding sound baths to their offerings. But, sound baths (a.k.a., sound therapy, sound healing, sound meditation, or vibrational sound healing) have actually been around in one form or another since the beginning of recorded history. In fact, sound therapy was first mentioned in ancient scriptures. The ancient Egyptians used vowel sound chants in healing, as they believed vowels were sacred, and the Greeks used similar healing chants and a variety of musical instructions in their sanatoriums, according to sivanaspirit.com. And, Tibetan monks have used singing bowls as part of their meditation practice for ages. Today, the sound bath typically entails lying on your back on a yoga mat with your eyes closed as the sound bath practitioner (often a yoga teacher, meditation leader, energy worker, or even a more spiritual massage therapist) plays crystal singing bowls to help put you in a relaxed, meditative state. 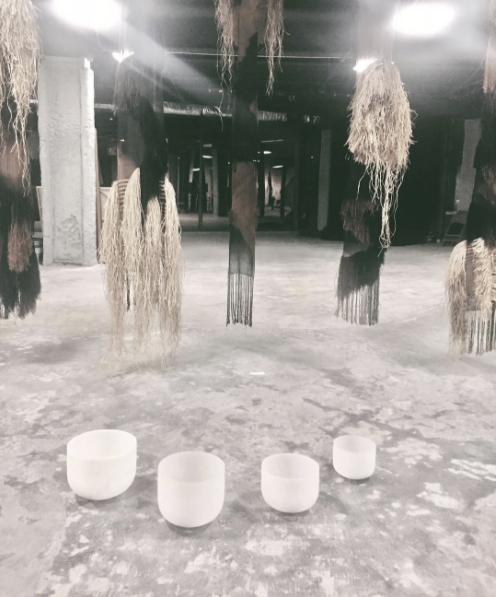 "I think sound baths have grown in popularity as more people are realizing the importance of relaxation and meditation due to the increasing amount of stress we face," notes Nicki Wong, co-founder (along with Lulu Biazus) of the Los Angeles-based sound bath community, Forestkind. The health benefits of meditation, including sound meditation, go far beyond mental health help. Though, helping with relaxation, anxiety, stress, insomnia, and depression, which has risen more than 18% since 2005, according to the World Health Organization, are still its biggest assets. "The biggest benefit to sound bath meditation is that it allows you to sink into stillness with pure tones and frequencies," explains Wong. "It aids the body into deeper states of meditation and the vibrations of the sounds interact with your mind, body, and soul to slow down, thereby increasing your mindful awareness, allowing you to briefly escape your thoughts as your brain waves shift from beta to alpha and hopefully theta." But, sound therapy also has a variety of notable health benefits as well. According to a research by the Medical College of Georgia, meditation can lower blood pressure, reduce the risk of heart disease and stroke, and can also reduce chronic pain, pain in cancer patients, and reduce symptoms in patients with fibromyalgia. It's also an often-used treatment modality in the alternative and holistic therapy community, as well as at addiction recovery centers. Passages Addiction Center, a holistic drug and alcohol rehab center with locations in Malibu and Ventura, California, uses sound therapy to help treat their patients, either alone or in conjunction with massage therapy, acupuncture, and/or spiritual counseling. 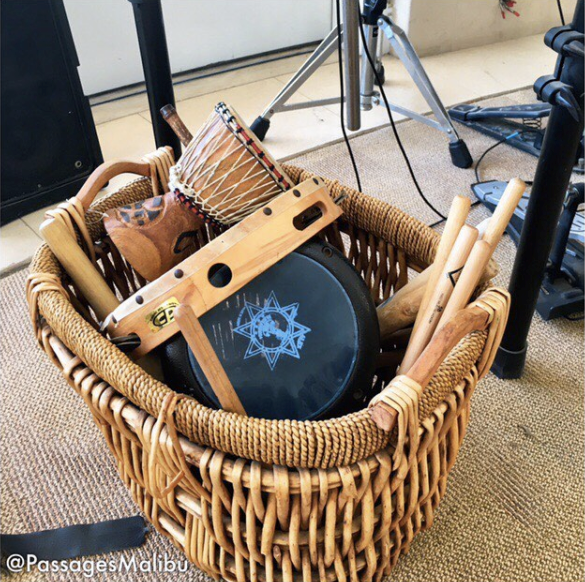 Passages Malibu uses a variety of instruments, including quartz crystal singing bowls, didgeridoos, Native American flutes, buffalo drums, gongs, and more in their sessions. "Sound therapy is cellular healing. It uses vibration to affect cellular resonance in the body to help heal the cellular ramifications of depression, anxiety, and trauma," explains Jesse Hanson, a spiritual counseling and sound therapist at Passages Addiction Center in Malibu. The first thing to bring to a sound bath is an open mind. It might seem silly at first, but if you give into the process, you could find it to be one of the most relaxing experiences you've had. On the flip side, some people find a burst of creative energy while bathing in the sound. Some sound bath practitioners even suggest that participants bring a notepad and pen in case an idea pops in to their head that they want to jot down. That aside, you'll want to wear comfortable clothes (no shoes, but you might want to wear socks to keep warm), and bring a yoga mat, a blanket, and if you have a meditation pillow already, grab that too. If you don't, most studios that offer sound baths will have mats and blankets and you can use a second blanket for your pillow. Like snowflakes, no two sound baths are alike. Some sound baths are guided with words and sounds, while others are silent, or a mix of the two. Some might include some form of energy healing, such as Reiki or chakra cleansing, which might include the practitioner waving burning sage over your body or using healing crystals. Some are in a yoga studio, meditation center, or day spa, while others are music and arts festivals or forests and gardens, which is where Forestkind has hosted sound baths. Everyone's experience is different. But, as someone who has been taking part in sound baths for a few years, I can say that my experiences have varied greatly. On numerous occasions, I was able to sink into a deep meditation - almost a sleep - that left me feeling extremely relaxed and calm on the one hand, but also refreshed and energized upon awakening on the other hand. On two occasions, I had the sensation that someone just walked up to my yoga mat and was looking over me. It didn't scare me; rather, it felt quite loving. But when I opened my eyes, no one was there. My last sound bath practitioner told me it was probably one of my guardian angels looking over me because this type of meditation can often help you get in touch with other realms in the same way that Reiki or energy work can. At another sound bath, I got a case of the giggles. If this happens to you, don't worry - it not as uncommon as you might think. If you need to step outside for a second, do it. For me, it was the sound of the person near me snoring that did me in. People do snore in sound baths, just as some pass gas in certain yoga poses. It happens.